[This website - upper] Gorillaz cooperation series shoes release and music project "Three Artists. 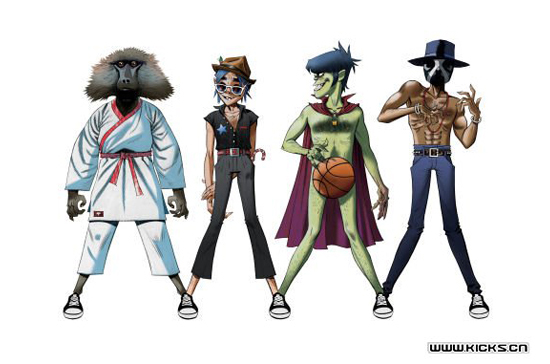 One Song" with Gorillaz, Jamie Murphy and Andre 3000 new single "DoYaThing" come out. Recently, CONVERSE finally unveiled its cooperation series with Gorillaz, the world's most famous virtual band, including four unique design shoes that will be officially released for sale on March 1, 2012. The design style will be the most classic Chuck Taylor All Star shoes. Combined with the band's legendary color patterns. Jamie Hewlett, an award-winning, globally-recognized designer and co-founder of the Gorillaz band, has created a number of patterns that combine various elements and personal styles. Almost every design incorporates members of the band, or The artists and musicians have different backgrounds and unique influences, trying to create a revolutionary new series. In addition to jointly launching co-branded shoes, Converse also invited Gorillaz, Jamie Murphy and OutKast's Andre 3000 to participate in the brand's traditional â€œThree Artists. One Songâ€. The music cooperation project created a single "DoYaThing", and this rare cooperation single will be available for free download on February 24th, 2012 at the website. Gorillaz is not only attracted by the fact that they have created a brand new music genre, but also because they have redefined the band concept. They combine alternative rock, hip hop, electronic and pop styles and interpret a unique type of music; at the same time, in the infinite virtual world, they try various fresh ideas, and have sold more than 15 million copies worldwide to date. record. In 2006, the band "Feel Good Inc" partnered with DeLa Soul won the Grammy Best Pop Chorus Award. In November last year, they released the long-awaited collection "Singles Collection 2001-2011." â€ Celebrate and share the ten years they have traveled together. The CONVERSE and Gorillaz co-funding series will be available on March 1, 2012, at major retail stores in Converse. As a loyal supporter of the CONVERSE brand, this Gorillaz co-branded collection finally blends the band's unique style with the classic Chuck Taylor All Star to create four different styles of shoes. Camouflage printed military style shoes, inspired by the band's first album of the same name, has become the hallmark of this series of iconic design. The theme of military uniform wind was also derived from another brown high-top canvas shoe with the famous Pazuzu devil totem printed on the band. At the same time, for this unique series of collaborations, the unique images of the band's various albums are used as the inner lining of the shoes. 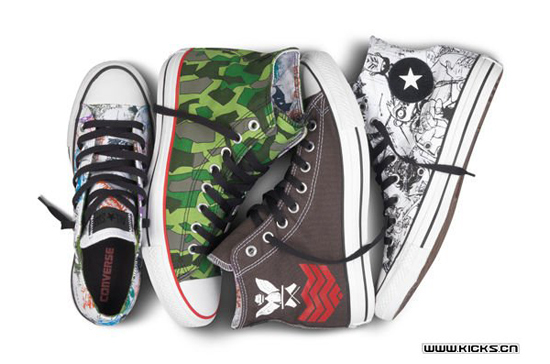 This series also includes another group of Chuck Taylor All Star high-top and low-cut shoes, covered in black and white prints and lined with Gorillaz camouflage patterns. The more distinctive details of this collaboration series, including the Gorillaz special heel logo and tag, are unmissable. Life is a cup of wine, a drunk. Life is a vision, desirable. Fragrance is strong, with a nose to feel; life is good for the heart to feel. The Soup Spoon, make you life more colorful. non-absorbing, not moldy, not easy to breed bacteria. Can be classified using, can be recycled, heat insulation, excellent surface finish. The bamboo fiber materials make secure using. high quality products high quality life.